Eucumbene dropping why?? If you are needing information why lake Eucumbene is dropping contact the Snowy Hydro!! I'm sure they will tell you a good story!!!! Most rivers are running well and fishing well with the warmer weather here now things are really starting to pick up. 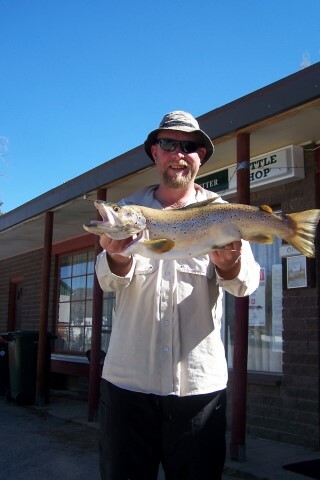 On the Monaro streams things are starting to pick with all streams fishing great but remember if you are fishing these streams we do Recommend catch and release (Please)!! Up around Jindabyne all rivers have calm down now and the fishing is good with all rivers running well and clear worth a look. Up higher in the mountains Thredbo, Perisher, all river are going well and don’t forget about all the small dams around the area again worth a look all fishing well. Good reports coming from Kiandra fishing the runs with a nymph and letting it run into the deeper holes with some good rainbows sitting in the holes “working well”. Remember if you can practice catch and release on all rivers that way you can come back next year knowing that fish will be a bigger and better fish a photo can tell many stories!! Fly fishing has been up and down on the lake that’s to do with the weather wind and more wind yes I’ve about had it as well!! But things are starting to warm up and the insects are starting to come out along with the mudeye’s so it wont be long now till the action starts. At the moment the nymphs, woolly buggers, minnows and woolly worms are the best wet flies to have. Middling Bank, Braemer Bay, Frying pan and Seven gates. Overall it’s a little slow on the fly but thing will change once the weather comes good. 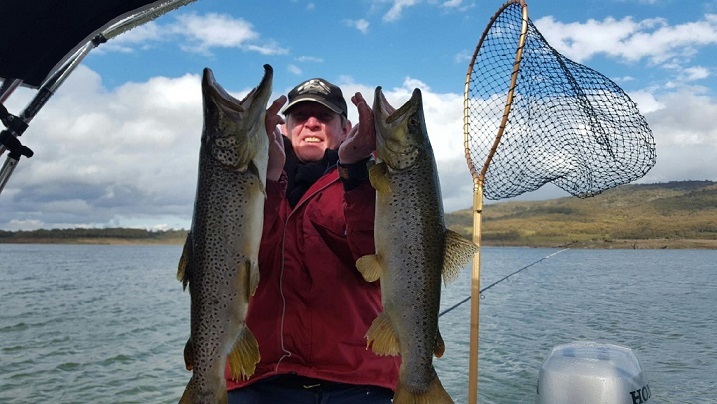 Peter from Braemar with an updated fishing report for the week ending Friday Nov 11th 2016. Well the news from around the Lake is that generally the fishing has been a bit quieter over the past week or so, factors possibly affecting this has been the influx of boats and people visiting for the annual trout festival and of course the windy conditions which thankfully have abated for now, but the most likely factor has been the sudden and dramatic drop in water level over the week which of course upsets the habitat significantly and thus the fish are no longer cruising the banks, obviously its a very political and controversial issue here but for goodness sake would it hurt anyone if the water was held back for a while ? at this rate we will be below 50% before years end !!!!!!!!!!!!!!! As mentioned reducing water means the fish are less likely to be enthusiastic about coming to the banks and this has been reflected in catch rates, fine sunny weather with a typical Eucumbene breeze presented anglers with the best conditions in a long while but the fish were not there to co-operate, bait fishing has gone right off at Braemar and from what I have heard at other locations across the Lake, but, mixed up amongst the gloom were some nice catches, mainly Browns in the 1 kg to 2.5kg range on all methods. The Braemar contingent entering the festival this year did very well, fish wise and financially with a few lucky people here sharing in over $4000 worth of cash and prizes so well done to them, the quality of fish, particularly the Browns has been great with 44 fish over 1.5kg weighed in over the week long event, best fish was from Scott Lomas who managed a very nice Brown just under 2.6 kg out of the water, Wilf Berkerley managed a Brown of 2.415 kg cleaned and Peter White managed a 2.7kg Brown on worms just before the festival started. Rainbows have been a bit elusive lately although there are plenty around in the 25cm to 30cm mark, those larger specimens have yet to show up this season, once the weather settles it is more than likely they will appear with a vengeance if insect activity increases. Mudeyes have proven to be successful on some days and other days are totally ignored, worms are still worth a go and lure casting is still accounting for very nice Browns, the Fly Fishing has fired up a bit with some nice Browns and smallish Rainbows taking slow sinking nymphs and midge pupa and the ever reliable woolly bugger is still tempting those big Browns after dark, special deal those people wanting accommodation prior to the Christmas rush, stay a week and pay for only 6 days if you mention this add and remember to call in to see Michael and his team at the Alpine Angler on your way through for fresh live baits. Best Tassie’s for the past couple of weeks have varied considerably with # 10 accounting for some decent Browns one day and then ignored for a week, other colours doing well have been # 44, # 56 , # 80 #94, #97, #123, #124 and # 125. Pictured below is Greg with his pair of 6 lb. 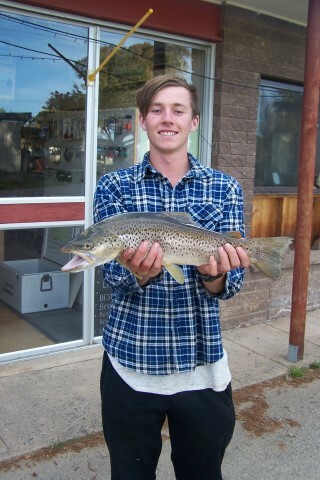 Browns representing the Belgrave Boys, Scott Lomas with his 2.6kg Brown and Jessie Mauger with his 2kg brown. At the moment fishing anywhere on the lakes you will get results not sure on what bait is doing it’s best the results are coming in with mudeye’s, worms, power bait. So if you are wanting bait for the trout fest you best start thinking about booking your mudeye’s and worms next week I’m sure they wont last long.